Hi friend! I hope you had a beautiful weekend! I spent the last few days up in Big River, SK presenting, catering, and participating in the 3rd annual Yoga at the Ridge Retreat. It’s an amazing fundraising event that I’ve taken part in the last two summers and it is always a highlight. You can read more about my adventures here if you’re interested. Lately I’ve been inspired by the beautiful berries that are in season so I wanted to share a recipe for a low sugar, grain free, vegan, pie that is JAM PACKED full of nutrient goodness and guaranteed to satisfy your sweet tooth without wreaking havoc on your waistline. Most pies are full of gluten, hydrogenated vegetable oils in the form of shortening, and tons of sugar, which makes them an inflammatory food that promotes dis-ease as opposed to a nourishing super food that helps you glow from the inside out. However, with just a few tweaks you can take a junky food to new heights of awesome without sacrificing taste. Instead of a regular pie crust that’s full of refined flours that spike your blood sugar and lead to insulin dysregulation and food cravings, you’re making a crust that is full of healthy proteins, fats, and fibres from the nuts, seeds, and oils you choose to use. Almonds and walnuts give this crust a deliciously roasted and savoury flavour while the flax adds as a binding agent to hold your crust together. Instead of shortening, you’re going to use a coconut oil. If you’ve been around the blog before you know that this is one of my favourite fats to use and for good reason! It’s full of medium chain triglycerides (MCTs), which are a type of fat that boosts the beta-oxidation (burning) of stored fat cells. They are also easily digested and absorbed and this makes them an excellent food for people who suffer from digestive issues. Finally, the MCTs are a preferential fuel source for your liver, which means it will help it detoxify harmful substances you may come into contact with in your daily life to promote clearer skin and better hormone balance. If your liver isn’t functioning optimally you may suffer from breakouts, hormone imbalance, weight gain, fatigue, and a whole host of other unpleasant symptoms. So eating clean and incorporating foods that support your liver is a great way to stay slim, trim, and healthy! Finally, the filling of your pie is made up almost entirely of super healthy, low sugar, and antioxidant rich berries. Look for local and seasonal produce to get the most bang for your buck! The filling mixture will work with everything from berries to apples & pears, so don’t be limited by what I used. Go to the farmer’s market and pick out what’s fresh! In a medium sized mixing bowl combine ground walnuts, almonds, and flax with coconut oil using your hands until a grainy texture is achieved. Add water and knead until combined. Line a circular pie plate with coconut oil and press crust into shape all around the plate until even. Bake crust for 10 minutes until it starts to go golden brown. 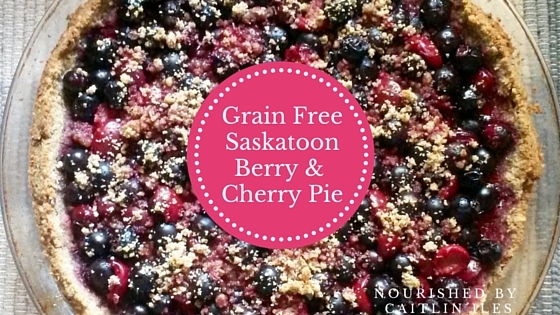 While crust is baking combine Saskatoon berries, cherries, tapioca, sweetener of choice, vanilla, and lemon juice in a bowl. Remove crust from oven and fill with berry mixture. You can sprinkle any leftover crust mixture on top of the berries for an extra crunch. Bake an additional 20 minutes or until berries are softened. Remove from over, let cool, and top with Ginger Pear Ice Cream. Well that’s the recipe for this week friend! I hope you enjoy it as much as my friends did 🙂 Have a beautiful week!